Because we remembered Holland fondly from our trip here in 2014, we decided to make it our first stop on this summer’s European adventure. We landed in Amsterdam and stayed in Rotterdam, making it our base for two or three days, visiting small towns in the vicinity and then making our way by train, with Eurail Passes, to France and south to Spain, then across to Portugal where we would end our month long vacation in Lisbon for a Jazz Em Agosto, a festival Irwin is covering for a second year. The trip started off with a bit of a scare. Two hours into the flight we were told by the pilot we would have to land in Goose Bay, Labrador, to evict a passenger who was being uncooperative. We couldn’t imagine what or who would create such a fiasco and by overhearing various conversations, we gleaned that it was a woman demanding alcohol who had risen to level 4 out of six levels of disturbances that require a plane to land. The stop in Goose Bay added two hours to our journey and surely caused Air Canada thousands, plus more fuel had to be added. Once we finally landed in Amsterdam I was exhausted physically and mentally and badly needed a rest and some peace. And that is exactly what we experienced in Rotterdam, getting on a train from the Shipol Airport in Amsterdam and riding about ½ hour to Rotterdam where we found our hotel, The James, about a 10-minute walk from Central Station. The James is a new boutique hotel that somewhat reminded us of our hotel NYLO in Manhatten, although it’s a third of the price at about $100 CDN. Since we were in Rotterdam in 2014 and visited the city extensively, we decided to travel to Delft, on the second day, and Dordrecht on the third. 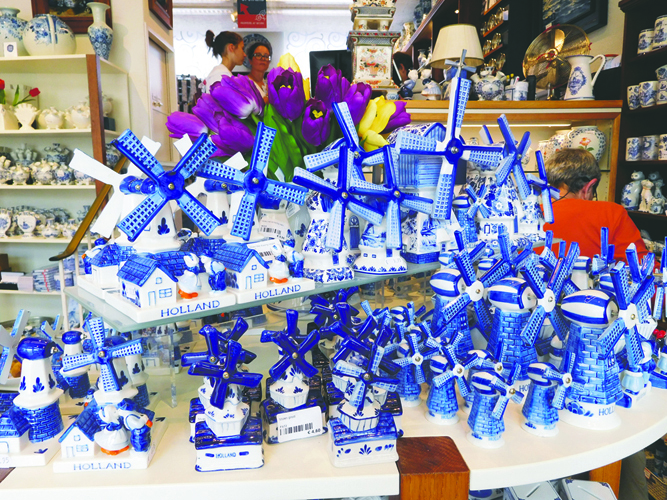 Delft, known for its blue and white porcelain, was 20 minutes away on the train, a lovely town crisscrossed by canals and lined by rows of old, low-storey houses with shops at the bottom. There’s one huge square where cheesemakers offer vacuum packed rounds of a local cheese with various flavours and spices. Samples abound in the shops. You hardly see a car here. People walk or cycle. 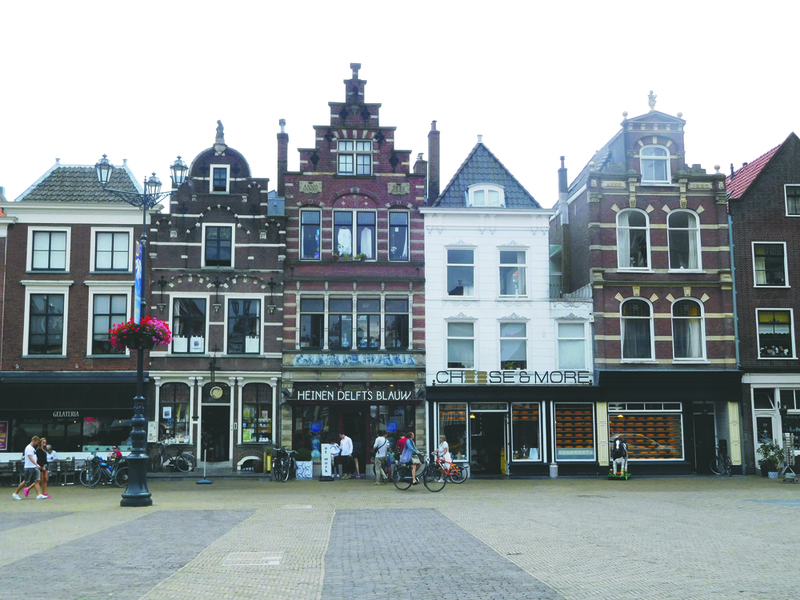 It’s the epitomy of the carless Dutch small town with human scale and a slow pace of life. Every kind of shop imaginable is there, almost all mom and pop. People are very friendly and helpful, and all speak English flawlessly. We shopped in Jumbo, a supermarket, and bought our lunch of yes, you guessed it, cheese, and fish salads. 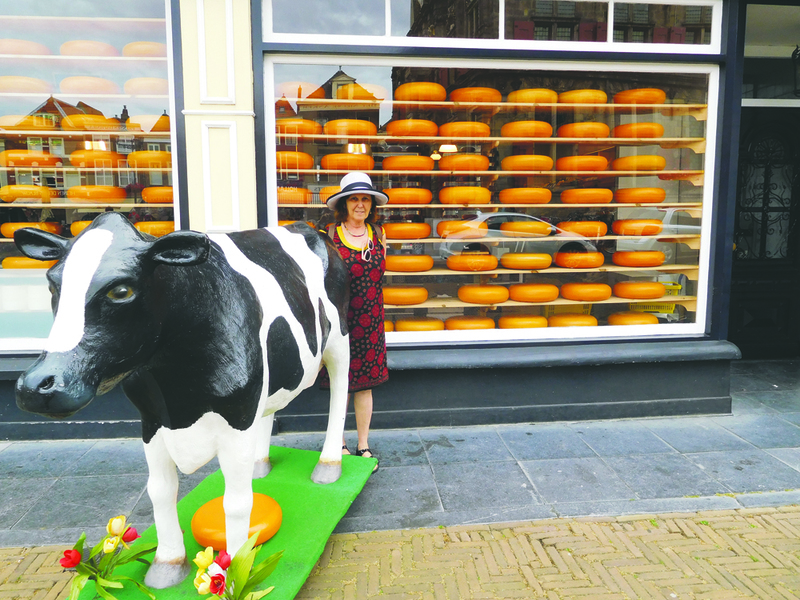 This is the best and most affordable way to eat and sample the amazing variety of cheeses this country has to offer. With our diet of no carbs or sugar and with me being a vegetarian, the healthiest and most fun way of eating is to visit the local supermarket and enjoy wonderful fresh produce. 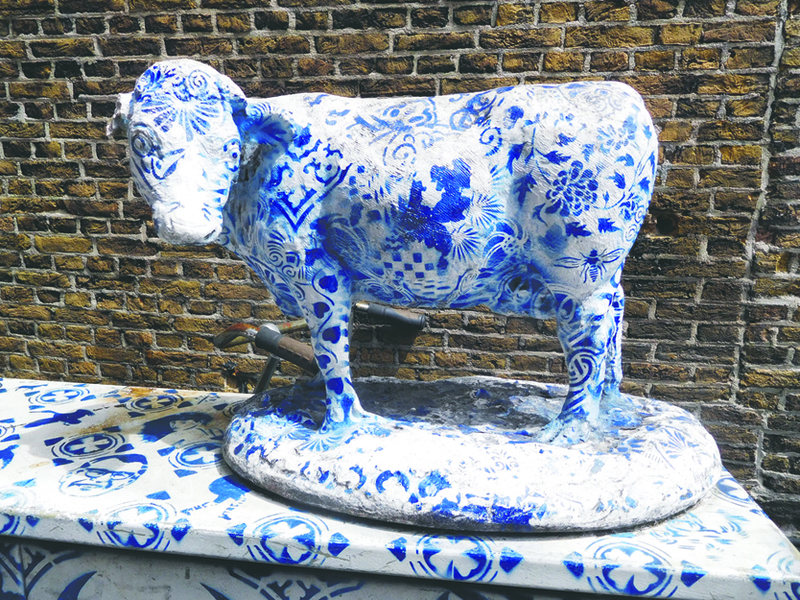 Why did we choose Delft? We asked a friendly agent at the Service counter of Rotterdam Central Station where he would suggest we go that was about 20 minutes away and he suggested Delft. His second choice was Dordrecht where we travelled the next day and as we emerged from the station, whom did we meet but Alex, the same agent, who happens to live in Dordrecht. He ran to get us a small map of the town and we proceeded to check out the older section where old buildings have been renovated and now house boutiques. The weather had turned decidedly chilly and I needed to stop and purchase a jacket and sweater. Once covered and comforted, we made our way along the lovely streets of this old town at one point watching children emerge on their last day of school, this being July 10, a bit later than our Canadian kids. Apparently the summer vacation is only six weeks here. There are so many cyclists in old fashioned bikes, sturdy and clunky looking but everyone on them looked happy and proud to be pedaling along. Some are equipped with carts for children and baby seats and no rider wears a helmet. With almost no cars, they run the show and the streets belong to them. Dordrecht is the oldest city in the South Holland province. Back in Rotterdam we spent our last day touring. Be the first to comment on "Times and Places: Holland is all about the canals and architecture"